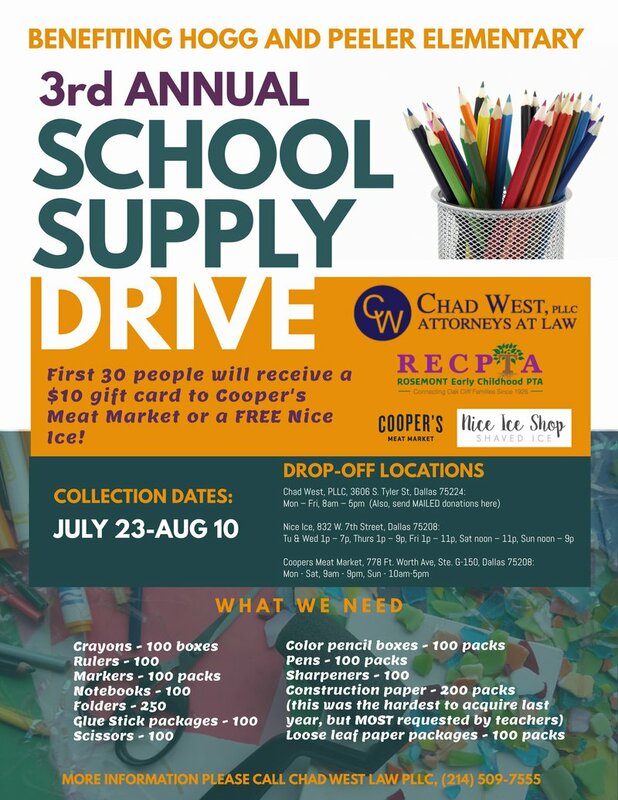 Chad West, PLLC has teamed up with Rosemont Early Childhood PTA, Cooper's Meat Market and Nice Ice to collect school supplies for local teachers. In prior years, our firm collected school supplies for students at Hogg Elementary School. The Mayor's Back to School fair will offer free supplies to kids, but because supplies run out fast, teachers often have to pay to replace them. So for Fall 2018, our drive is for the TEACHERS. Thanks to our partnership with Rosemont Early Childhood PTA, we're adding Peeler Elementary School to this year's supplies drive. Nice Ice and Coopers Meat Market have provided a limited quanitity of $10 gift cards for the first 30 people who drop off supplies at ANY of the three drop-off locations. Don't want to brave the heat? You can mail supplies from Amazon to Chad West, PLLC, 3606 S. Tyler St, Dallas 75224.